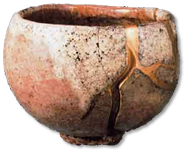 This process is called Kintsugi – read more about it here. What a different mindset from the “if it’s broken it has no value” meme that is currently embraced today. It brings up so many interesting topics for consideration: how we strive to attain (and own) flawless perfection, how more and more things are replaced before being repaired (or are unable to be repaired), and what might be available if we created the process of repair as a meditation – really looking at the break and what it reveals about the design/object/process. And yet there is always a point in time when it simply makes no other sense than to start over. I face this regularly as clients bring old, outdated site architecture to me wanting a revamp. I’ve also been considering The Slow Web which creates the concept of disengaging from the constant barrage of stimuli available to us in favor of being present – of choosing how much, and what we do, when. Consider that the true failing is having only one answer/solution/process, or perhaps even falling into the trap of relying on the same one all or most of the time. As always, it’s about perspective and being present. And just because it works for me, does that guarantee it works for my client? Where do you rely on the same response, solution, or reaction? And what would be possible if every interaction was a considerate creation instead?